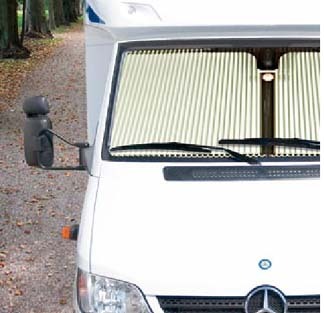 This popular cab shade system includes shades and frames for the driver and passenger front windows as well and the windshield. Installs easily using included hardware. Some drilling required. Imported - Made in Germany Allow 1-2 weeks for delivery. For REMIS the quality of its products comprises not only ease of operation but also simplicity of installation. All the parts match easily into the design of your vehicle.The front window blind is fixed to the securing points on the A-pillar provided by the manufacturer and is held in the center of the windscreen by a tube system; the side parts are screwed into the door frames. With the system it no longer matters whether it is day or night. The attractive REMIfront III-S darkening system provides not only darkness but also privacy. The integrated solution of front blind and side parts darkens your cab almost completely. At the same time the shade keeps the cab cooler in summer and warmer in winter. Provides shade and privacy instantly. Shades are held in place with magnets. Made in Germany. Usually ships by the next business day.